The rising cost of textbook is a nightmare for today's college students and parents nowadays. The rising cost of textbook is a nightmare for today's college students and parents nowadays. College students who manage their education and daily expenses while doing a part time job really feel overburdened with the high cost of textbook. On the other hand, parents similarly feel depressed during back to school time due to the obvious pocket burning school supplies along with pricey textbooks. As per the student aid study of 2007-08 National Postsecondary, "full-time students spent an average of $834 on books and supplies for their college classes". Textbook cost can vary depending on the type of course, standard of college and also edition of the text. But according to the study, textbook inflation will continue. The study said, "The average annual increase in college textbook prices from December 2001 to November 2010 was 6.1%, varying from a low of 4.1% to a high of 8.3%. The current annual cost of college textbooks in 2014 should be about $1262 on an average." Here are some tips to cut down on the rising cost of textbook. Students must explore the ways to beat the rising price of their textbooks. Spend more time in library. This is the best way not to buy all books at a time. You can get your textbooks from your campus library. Try to be a member of your local library. However you may find some difficulties there such as, unavailability of recent edition. Many libraries do not allow to take textbooks to their home. Thus, you need to read the book at the library. Try to copy the chapter you require and study. If you have enough time, then you can study while sitting at the library. Go online to get your E-textbooks. Some online retailer such as CourseSmart, Inkling, Amazon, and Barnes & Noble can be your destination to grab your textbook. Download the "e-reader" apps to read the chapters whenever you want. You can search your desired chapters, bookmark them and highlight the quoted lines as well by the help of this app. You can also buy ebook version at a low price in comparison to the market value. E-books will save a lot of time also as you don't required to print them. Just save the chapter and read online or offline in your mobile, tab or laptop. Do not buy all books mentioned in your syllabus. Find out which books are needed for the coming semester or class. Ask the professor or class teacher to know which one he/she will follow throughout the semester. Sometimes, books are listed as "optional" in your syllabus. So, buy books after confirmation from the teacher. Always buy international edition instead of US edition. International edition of textbooks are generally cheaper than others. There are no such noticeable difference between an international edition and US edition of textbooks. You may find small difference in cover which is very insignificant. Comparison shopping can help to save your money. Try to review the price online before buying textbooks from your campus store. You will surely find a significant difference in price. Your campus store may charge some extra dollar in addition of tax but buying online can save that extra dollar. You should visit different websites to check the availability or prices. Sometime, you can purchase second hand textbook from websites which are cheaper and can also get discounted books. Try to use free search tool to compare prices. 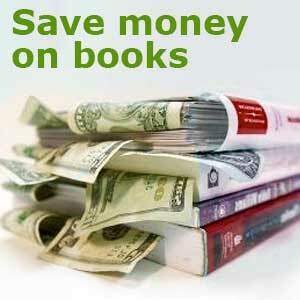 If you don't mind reading used books, then buy second hand book to save big bucks. You can also find used books listing online. So, grab them without any hesitation. You may rent books for a certain span of time. Moreover, you can sell your books after completion of your study to get back money as well. Lastly, share textbooks with your classmate to save money. You should share your resource with others. Thus you can enrich your knowledge and save money as well.